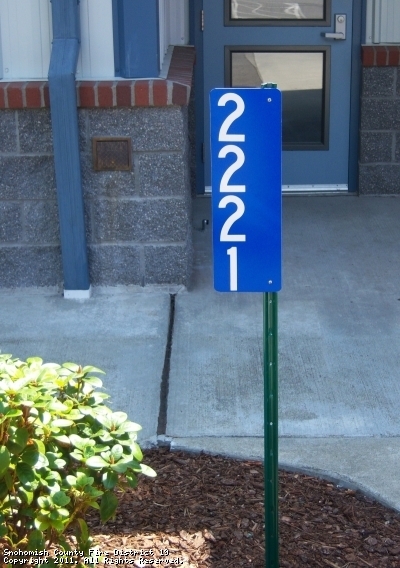 Snohomish County Fire District #19 offers blue reflective address signs free of charge to citizens residing in District #19 through a grant provided by the Stillaguamish Tribe of Indians. To assure that we will be able to find you in an emergency situation, we ask that if you do not have a reflective address sign similar to the one shown, that you contact us to allow us to create one for your residence. These signs are instrumental for assisting us to find you in case of emergency. If we are unable to find you, we are unable to help you! In addition to creating an address sign for you, we will also post it for you to give our firefighters and EMT personnel the best chance of locating you. Often times multiple signs must be created for long driveways etc. so be sure to call us with any question or concerns you might have. If you do not reside in Fire District #19 and wish to have a reflective address sign the cost is $10. We will gladly make one for you. Call 360-652-8277. This site has been viewed 101,395 times.